Seasonal safety … With fall weather just around the corner, the Grand River Dam Authority passes along some important safety tips to keep in mind this time of year. • Before firing up the cold weather tools like leaf blowers, be sure to inspect the power cords for unusual wear and tear. Replace or repair worn cords right away. • Have any battery chargers you won’t be using until spring? If so, be sure to unplug them and store them in a safe place. • Use only weatherproof electric devices for outdoor activities. Make sure any electrical equipment that has been wet is inspected and reconditioned by a certified repair dealer. • Keep dry leaves well away from outdoor lighting, outlets and power cords. • Make sure your electric blankets are in good shape and have a tag showing they have been certified by an independent testing lab such as UL, CSA or ETL. Check those power cords and make sure they are not frayed or cracked. • Do not tuck your electric blanket under mattresses or children and do not put anything, such as comforters or bedspreads, on top of the blanket while it is in use. 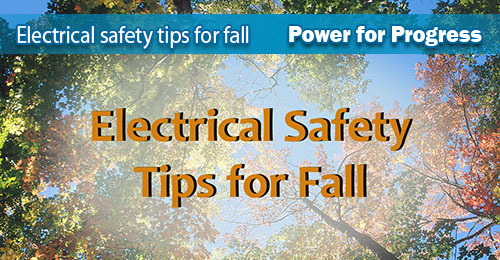 Remember, both indoors and outdoors, these tips can help promote electrical safety during this time of year. From your friends at GRDA, stay safe and enjoy the changing seasons!